FACT CHECK: Does The Federal Government Borrow $1 Million Every Minute? Republican Sen. Rand Paul claimed Thursday that the federal government borrows $1 million every minute. The annual federal deficit has averaged more than $1 million per minute since fiscal year 2016 and is projected to reach around $2 million per minute in FY 2019. Congress passed a two-year budget deal early Friday morning. Although lawmakers still have to appropriate specific spending by late-March, the deal addressed spending priorities of both parties by hiking defense and domestic spending caps in addition to allocating $90 billion in disaster relief funding. The deal received bipartisan support in both houses of Congress, and President Donald Trump signed it later that morning. The budget deal is projected to add $320 billion to the federal deficit over the next decade. Paul, a fiscal hawk, opposed the deal and demanded an amendment to cut federal spending. Delaying the Senate’s vote on the budget bill with a series of roadblocks and floor speeches that ultimately resulted in a brief government shutdown, Paul underscored how U.S. deficit spending is too immense to ignore. Paul made the claim multiple times on Thursday, and again on Friday. Data from the Federal Reserve Bank of St. Louis (FRED) indicate that the federal government’s spending exceeded its revenue by $585 billion in FY 2016. 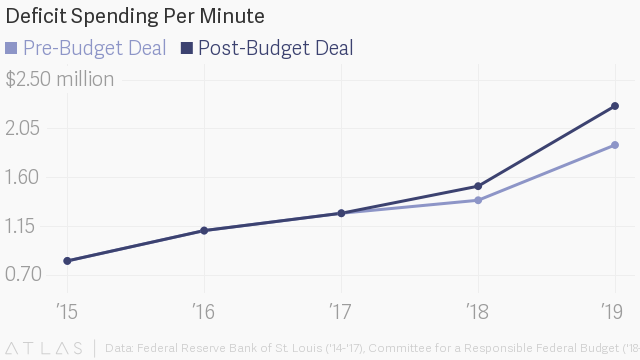 While the Treasury Department does not actually borrow money on a minute-by-minute basis, the deficit averaged out to $1.1 million of new debt every minute. FRED data show that the deficit increased in FY 2017 to $666 billion, averaging $1.3 million per minute. With the passage of the budget deal, the Committee for a Responsible Federal Budget (CRFB), an independent think tank that advocates for deficit reduction, now projects that the deficit will grow to $800 billion in FY 2018. This averages out to $1.5 million per minute, consistent with Paul’s claim that current borrowing is “closer to $2 million” per minute. Paul’s office told The Daily Caller News Foundation that Paul was using his office’s estimation that Congress will actually end up spending even more than what was agreed to in the budget deal and, as a result, run a deficit of $1 trillion in 2018 – which averages out to $1.9 million per minute. CRFB estimates that deficits will balloon to $1.2 trillion in FY 2019, or $2.3 million per minute. This is about $400,000 a minute higher than before the budget deal was passed. Congress’s budget deal marks a stark departure from the fiscal discipline it had legislated in the Budget Control Act of 2011, which instituted federal spending caps and automatic sequestration if Congress could not agree on spending cuts. Sequestration, in addition to broader economic recovery from the Great Recession, helped reduce annual budget deficits by more than two-thirds from a peak of $1.4 trillion in FY 2009 to $438 billion in FY 2015. The deficit started increasing again for the first time in years in 2016 as entitlement spending grew and tax revenues were lower than expected. The fiscal outlook then worsened when the GOP – with Paul’s vote – passed a major tax cut in December that is estimated to add at least $1.5 trillion to the national debt over the next decade. By FY 2027, CRFB estimates that the deficit could balloon to $2.1 trillion, or $4 million per minute. Contributed by Kush Desai of The Daily Caller News Foundation.